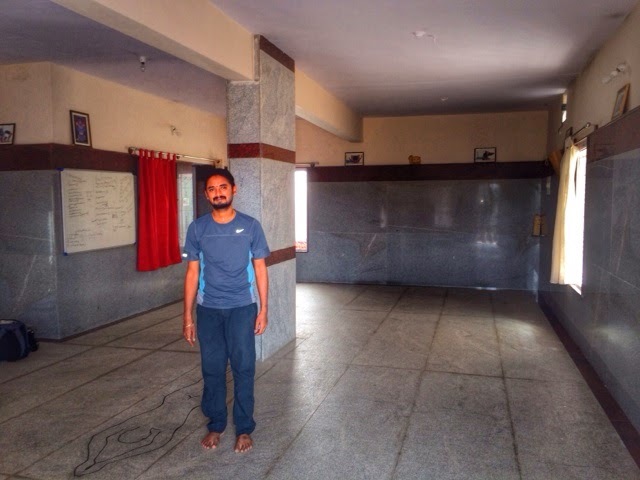 I had heard so much about Vinay Kumar and his Prana Vashya Yoga class that I was really excited about meeting him for an interview. Almost all the people that I've met in Mysore have practiced with him at one point in time and they all have nothing but positive comments about him. 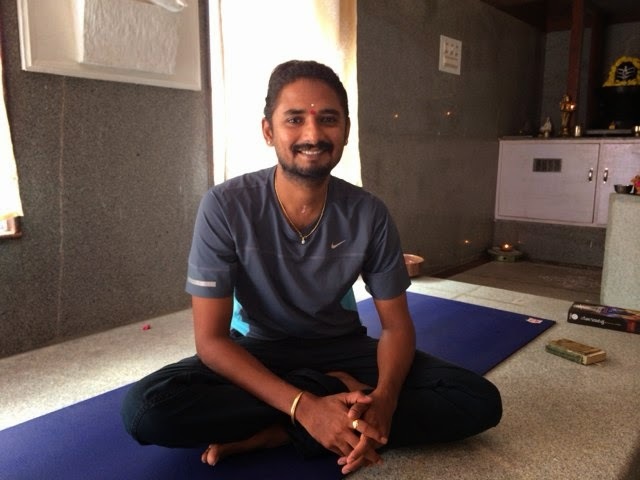 Most people that practice Ashtanga Yoga early in the morning with different teachers around Mysore like to join Vinay's famous back bending class in the afternoons. "He is a master yoga teacher" people like to say. My first impression when I walked in his Shala was "wow, such a beautiful shala." 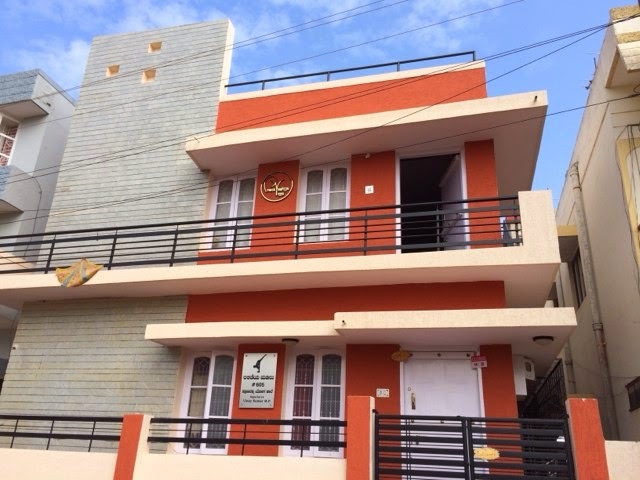 Everybody had told me about what an amazing teacher Vinay is but nobody had told me how beautiful his shala was. 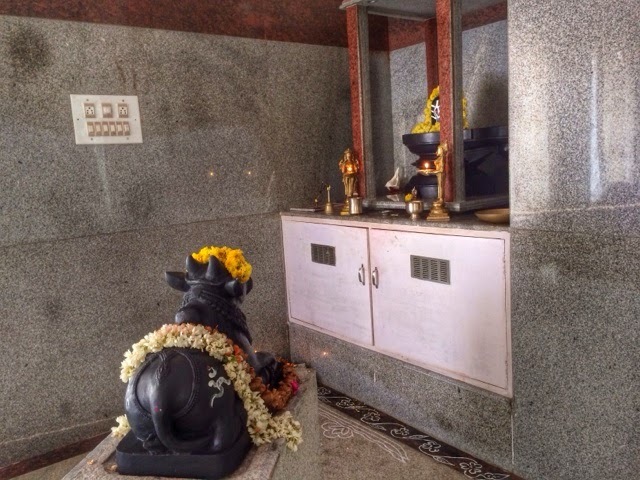 The whole floor and the walls are covered with stone slabs and on one corner there is a Shiva Lingam with a Nandi next to it, Shiva's bull, so it gives you the feeling of being inside a real Hindu temple. I remembered Iyengar's quote "the body is my temple and asanas are my prayers." I guess in this shala one can certainly live those words. 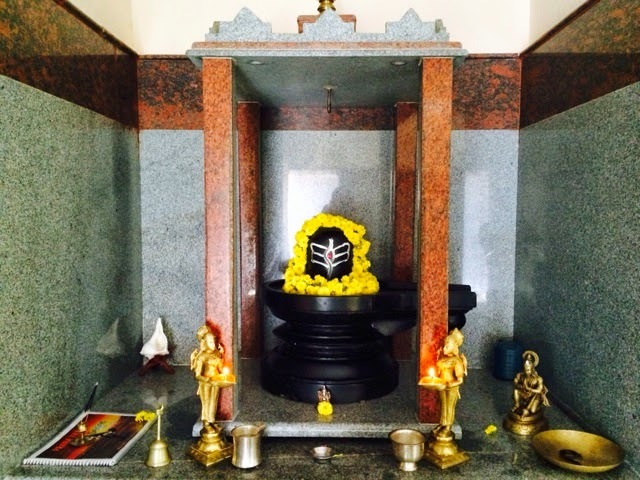 When I entered the shala I found Vinay standing next to the Shiva Lingam doing his puja (rituals and prayers). He gracefully greeted me and offered me a place to sit for a couple of minutes while he was finishing with his morning worship. I immediately felt his kind and gentle energy, he even apologize for making me wait. 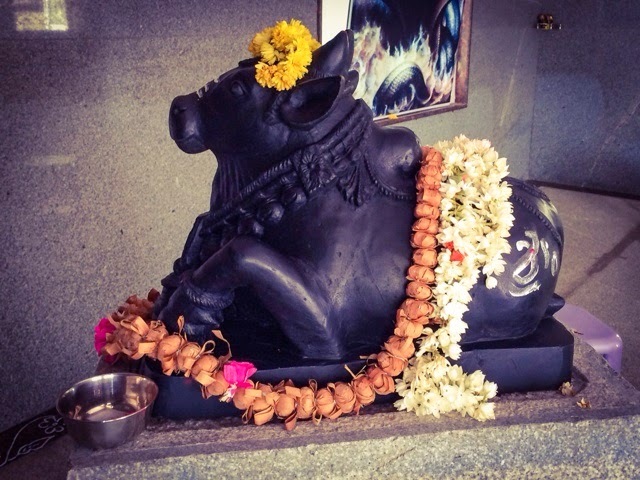 I felt very comfortable in his presence, like if I had met and old friend, and while I was listening to him I couldn't avoid thinking that I definitely want to come back to Mysore in the future to join his class. Since he is Vijay's elder brother and teacher it just feels right. Please, tell us a bit about yourself, how did you get started into your yoga path? I was seven years old when I first saw my teacher's photo on some fliers. I was very much fun of gymnastics and I thought yoga was a similar approach. So I met my teacher, Jalendra Kumar, and started to practice yoga asanas with him for about four years, still imagining becoming a gymnastic one day, but later when I was introduced to pranayama my life changed. I was thirteen years old when I started practicing pranayama and within two years I saw a lot of changes in my mind, on the way that I use to think. It gave me a different approach to life. Tell us about Prana Vashya, how did you came up with this method of yoga and what is it all about? 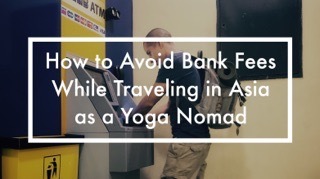 I was practicing hatha yoga with my teacher and Ashtanga Yoga with some practitioners but I found that it was not enough for my personal practice. I could find my mind easily wandering because asana postures accomplishment was very easy for me, I could not focus. I was aware that my mind was still not finding that satisfaction to stay with the body so I started to think about the approach of pranayama and the different levels in which the mind tends to get inside the body. I had found that pranayama had a deeper connection with the Self than the body has. Eventually I started to work on some asana sequences that could help me focus more, and I also started to align some asanas in groups so that they could give their own specific impact to the breath and the mind. A proper practice of yoga asanas can help to keep the attention on the posture, experiencing how much air one can take and observing how the mind feels but I wanted to get that connection between a few postures which could also change the rhythm and frequency of the mind, experiencing emotions that we could relate to our normal lives like anxiety, nervousness, calmness or peacefulness. I wanted to bring forward those mental states to became aware of them giving us control over all these states of mind. The sequencing of postures can bring a different influence on the mind. If you perform some postures separately they have one influence, if they are group together in a particular way then they have a different influence. One reason is because when you stretch or compress a particular part of the ribs it makes the lungs move in one particular way and if you compress another part of the ribs it makes them move in a different way. When you work with the asanas in connection you'll be able to see how the mind wavers, you can see the fluctuations of the mind. So the intention was mostly to become aware of how the mind works in different asanas. That's what makes me more curious and it was my own practice for about five years. Then I introduced it to to my students and I was able to see a gradual change in them. I started teaching when I was maybe 11 or 12 years old. Initially I was training competitors for higher level of competition, trying to see perfection in postures but then I started to get a better understanding about the practice, about how to make a person work and about what is important. When I was 14 I had people who had been practicing for about 40 years or 50 years and I started teaching the Prana Vashya sequence when I was 17. So it was very easy for me to see the difference between what I use to teach and this new sequence. What's the purpose of the application of breath locks (kumbhakas) or breath retention during Prana Vashya's sun salutations? Basically we use both, the antar kumbhaka (internal breath retention) and bahya kumbhaka (external breath retention), but not in a very big way. According to my experience certain movements need kumbhakas because they make the body parts independent and provide energy to only those group of muscles which really need that activity. The kumbhakas also helps us to become aware of how the mind feels when it is totally happy and when it is completely down. This two types of breaths, the inhalation and exhalation, can be a clear symbolic representation of our emotions; the breath is a reflection of the states of mind. When we are happy or excited we usually take the breath in but when we feel sad or loose hope we breath out. So I wanted to see the connection between the breath and the mind. When I started to work with the breath locks and with pranayama I noticed how they help to focus the mind and keep it within the body, specially when you have a bahya kumbhaka approach. The mind then tends to see what I'm really intending to do and my complete 100% awareness will be coming to the body. What usually happens after a particular period of practice, once one get use to a particular sequence or series, is that yoga asanas becomes a record of the subconscious and the practitioner is be able to practice without even focusing on what he is doing, he/she doesn't need to get the same level of attention, but with this kind of approach, by applying breath locks, we give the mind stability. Physiological speaking the retention after inhalation helps us enhance oxygen intake, but when we hold the breath after exhalation the body becomes more wanting for breath. Initially it could be difficult but eventually the body will get more and more powerful as we develop control over the retention after exhalation during the movement. Then the body will learn to take the best out of each breath providing more satisfaction to the physiology. How many sequences or series are there in Prana Vashya? There are two sequences which I have developed and which I practice. I'm starting to introduce the second sequence to a few practitioners that have been practicing with me for a while. The second sequence or series is more like a promotion of the first sequence. After performing the first sequence for a while gaining control over one group of muscles in a particular way and by developing their capacity, a practitioner will be able to accomplish the next level of postures. Based on that I developed the second series. There seem to be a lot of new methods or styles of hatha yoga, specially in the Western world. Why do you think is necessary to have another new method like Prana Vashya? I think the various techniques or various styles of hatha yoga approach the mind in different angles. Maybe in one way something will click and the practitioner will get more deeply into the mind instead of remaining more with the body and its appearance. When a practitioner perform a posture and can hold the posture for a while, if he is consciously observing the muscles then he is performing hatha yoga but if he comes out of the posture and lets the mind go out of the class, out of the mat then it is not really yoga. So basically, if the method is helping the practitioner to go into the mind and see the wonders of the mind then it is beneficial no matter what system they follow or what type of practice they do. Why should we practice Prana Vashya? What are the benefits of these practice? The main benefit that I'm intending to bring in the practitioner is calmness, stability of the mind, which affects the way in which one faces life. This is my path, this is what I'm really interested on. When a person is not able to face life challenges he/she might have to deal with lots of emotional disturbances that will affect his mind and body making him suffer, not allowing him to experience peace at all. So the idea is to bring more confidence into the person by saying "If you can control your breath on the mat then you can have control of your life" that's what we mean by Prana Vashya, "control of your emotional responses towards life challenges." Then, when you are able to see life neither in an over excited state nor on a complete depressed state you will have the stability and clarity to see the world in its own true essence. What's the difference between Prana Vashya Yoga and Asthanga Vinyasa Yoga? In Ashtanga Vinyasa Yoga moola bhanda is the basic foundation of the practice, but in Prana Vashya we prefer to go to the spine from the outside instead of coming from the inside. Instead of aligning the pelvic bone from the inside, when performing a posture, I prefer working on the posture from the extremities. So we use an external approach. For example, this hand position will decide how much my shoulders will work, my ankles position will decide how my hips will respond, and so on. In that way I try to work into the spine from the extremities, I try to align the body from the outside towards inside. That's why we don't use the concept of moola bandha and since there is the support of breath we don't need to align the pelvic bone, it naturally align itself when we approach it in this way. So Prana Vashya is about developing consciousness from the extremities towards the inside, Ashtanga Vinyasa Yoga is developing consciousness from the inside towards the outside. Both methods are good, they both help to keep the attention with the body. I understand that you started to practice Ashtanga Yoga since a very young age. For how long did you practice it and why did you stopped? I practiced Ashtanga Vinyasa Yoga for about three years. It was more a curiosity, I was very curious as a practitioner. I used to spend six hours, seven hours on the mat without getting tired and I used to skip school for my yoga practice. I was a completely devoted yoga practitioner for I don't know what reason, I had this craving within me that kept me on the mat and that helped me to see how things work. This interest brought me all over India to see different practitioners. I also had the opportunity to reach competition levels, I did competitions in different parts of India where I used to meet people. I had a craving for this knowledge, not just for hatha yoga but yoga in general. 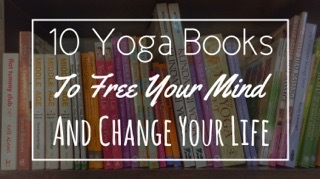 For about five years I dived into this yoga path which gave me lots of insights. I really admire Asthanga Vinyasa Yoga, the approach of the sequence. If it is performed in the same way as it is supposed to be done it has wonderful results. This practice has a lot to offer, I can't say anything against it, but since I started practicing pranayama my focus was more on bringing an influence on the mind in a different way, I wanted an approach that links pranayama with asanas more deeply. I know you have a really busy daily schedule, how do you manage? At what time do you get up in the morning, at what time do you go to sleep, when do you do your practice and when do you eat? Basically the only satisfactory things which are happening at the moment are my practice and my classes. I stopped thinking about myself, my hunger, for a long time already. My days start at four o clock and my classes start at 5:15 or 4:45 am and it goes on until 12:30 pm and then again from two o clock until seven o clock in the evening. So that's about twelve and half hours of work each day. Apart from my classes and my own practice I'm not doing anything else. I'm not able to reply to emails or Facebook messages properly because I prefer to do my practice, but this has giving me a little bit of dissatisfaction because I think people might feel sad about it, it might has brought problems to many hearts, even without my intention. So these are the only two things that are going well. My practice and my classes. I eat very little now cause after so many years of pranayama you need less. So, how many meals a day do you have? Only one meal a day? Breakfast, lunch or dinner? Whenever I find time. It may not need be a breakfast, it may not need be a lunch. I start a 5:15 in the morning and there is no break, I'm the only person sitting here all the time, my students change and I prefer it being like that. Actually my days off are not so good for me because then I'm more with the mind. During my work days I have less time for my mind to trouble me. To be able to dedicate myself to my practice was the main reason why I decided to teach. I had the option to study engineering first but I had seen my seniors starting engineering and stoping their practice and I really didn't want that happening to me so I decided to adjust my way of life, to teach yoga professionally so that I could remain in my practice. So that was the basic intention why I didn't want to continue my studies and that's the only reason why I think I don't get tired during my classes. People ask me many times "Don't you get tired?" but I never feel tired because everybody gives me so much energy. Good practitioners make good teachers so I prefer to be with good practitioners and working for myself. But later on in life I thought that I should have studied so I decided to take a graduation course in psychology and I was able to do it well because of the support of pranayama. I wanted to see what psychology wanted to say. Luckily I found that most of what I was practicing in real life was true. This gave me more confidence on my approach. For how long did you study psychology? It was a three years course. Yes, I was still teaching. What is your practice now? I practice my sequence every day and I practice pranayama. In the morning before my classes I do pranayama and in the evening after my classes I practice asanas. 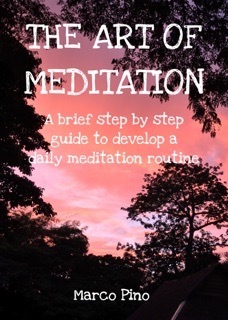 And do you do sitting meditation? Asana and pranayama naturally evolves into meditation. If we compare them to cycling, asana and pranayama are like pedaling but the bicycle naturally moves towards meditation. You have a very flexible and supple body however you started practicing yoga at a very young age. What's your advice for people that started yoga at an older age, or haven't even started yet, and want to attain a flexible and suple body like yours? Basically I think that if the mind is inside the body everything works well, the practitioner will be conscious of what he can do and what he cannot do. He will be able to understand his limits. So, if he has his consciousness present inside the body while he is practicing then there is nothing to regret, any age for that matter is good for yoga and not just yoga asanas. If the practitioner sees yoga asana practice as a tool to develop more awareness about the behavior of their own mind then any age is good, and honestly I would not suggest anybody to practice yoga asanas with the intention of accomplishing different advanced postures. It is important though to become aware of the different ranges of motion or states of physical activity like when we are sitting, standing, walking or running. What we are trying to do in yoga asana is to just observe all these different ranges of motion allowing the mind to remain calm within so that we can adapt to any situation in life without experiencing any stress. This is what the world needs nowadays, then we could live to our fullest potential enjoying a peaceful life and a healthy life. 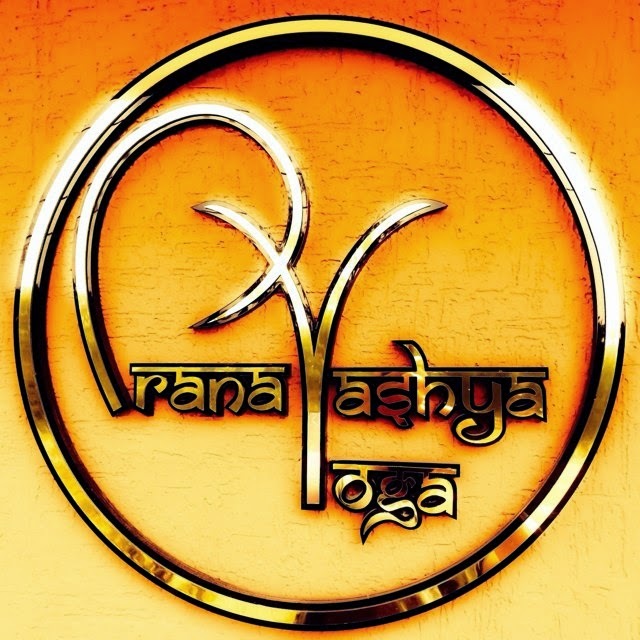 What's the future of Prana Vashya? I hope it will continue helping more people, if people can become leaders here then they can become leaders outside. So lets be less followers and more leaders, that will be a good for yoga. I'm not intending to promote Prana Vashya, I want people to be in yoga asana practice whatever style that might be. I want to spread the consciousness of yoga. I'm happy with people supporting me and having good practitioners around me so I'm always looking forwards to serve my best. I intend to give my best until I can. 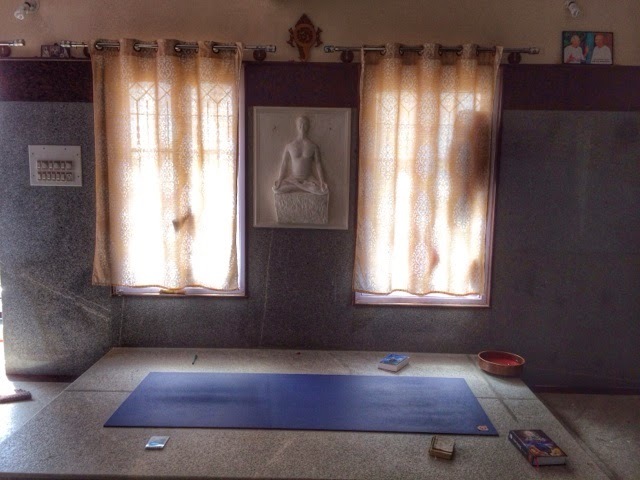 Vinay Kumar teaches Yoga at the Prana Vashya Yoga Shala in Gokulam, Mysore. 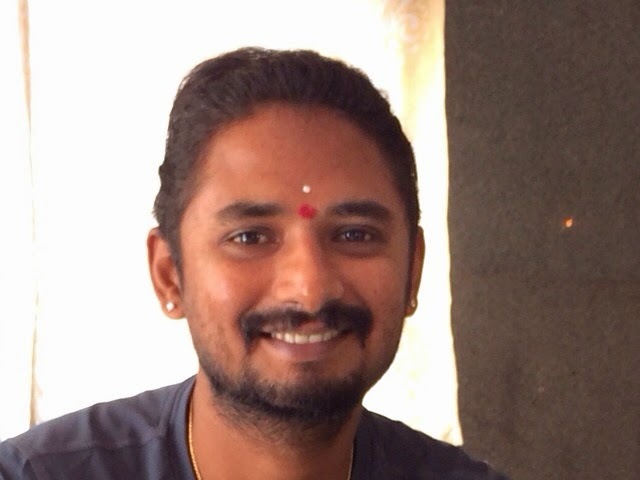 To get in touch with him you can visit his website www.pranavashya.com, contact him via e -mail: pv.yogainfo[AT]gmail.com or by phone at +91 9480487552 (Pooja), +91 94804 87550 (Vinay - after 8 pm on weekdays).